External: This is the most popular method of holding objects, it is the most simplistic and it requires the shortest stroke length. 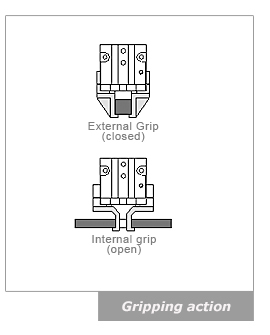 When the gripper jaws close, the closing force of the gripper holds that object. Internal: In some applications, the object geometry or the need to access the exterior of the object will require that the object is held from the center. In this case the opening force of the gripper will be holding the object. OMEGA Engineering offers a wide range of grippers in Philippines. How does a gripper work? The most widely used gripper is the pneumatically powered gripper; it is basically a cylinder that operates on compressed air. When the air is supplied, the gripper jaws will close on an object and firmly hold the object while some operation is performed, and when the air direction is changed, the gripper will release the object. Typical uses are to change orientation or to move an object as in a pick-n-place operation. The most popular types of pneumatic grippers are the 2 jaw parallel and 2 jaw angular gripper styles. Parallel grippers open and close parallel to the object that it will be holding, these are the most widely used grippers. They are the simplest to tool and can compensate for some dimensional variation. Angular grippers move the jaws in a radial manner to rotate the jaws away from the object and therefore require more space. There are also 3 jaw and toggle style grippers that are designs for more specific handling requirements. Grippers have a force rating that is referenced with an air pressure. The force of a gripper is influenced by the air pressure, if you increase the air pressure by 20% then you have increased the force on the griper by 20% (up to the gripper maximum air pressure rating). This also gives you the ability to reduce the gripper force by using an air regulator. If the object has two opposing flat surfaces, then 2 jaw parallel gripper is desired since it can handle some dimensional variation. Jaws can also be designed to handle cylindrical objects with the 2 jaw concept. Keep in mind that a retention or encompassing grip requires much less force. Grip force must be adequate to secure the object while a desired operation is performed on the object. The type of jaw design must be part of the force requirement. Keep in mind that you should add a safety factor to the amount of force that you select and air pressure is a factor to keep in mind. This applies both to the work being performed on the object and the amount of room for the gripper jaws. If the work is to the exterior of the object then it may require an internal grip. Angular grippers are usually less expensive but require additional space for jaw movement. Harsh environment or clean room applications require grippers designed for those purposes. When air pressure is lost, the gripper will relax its grip on the object and the object may be dropped. There are spring assist grippers designed for this type application. A parallel gripper opens and closes parallel to the object that it will be holding. 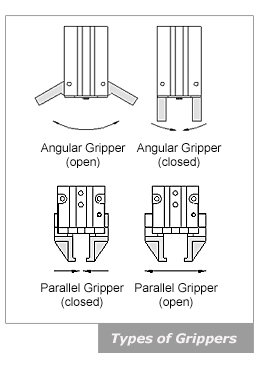 These are the most widely used grippers. They are the simplest to tool and can compensate for some dimensional variation. An Angular gripper moves the jaws in a radial manner to rotate the jaws away from the object. This allows for the jaws to move completely away from the object. The object may also be fed directly into the jaws and possibly eliminate one additional motion. A pneumatic gripper for harsh environments is constructed with clean room grade grease and are equipped with shielding to protect the moving components from particulate. External components are made of corrosion resistant materials for resistance to de-ionized water or for use in FDA and medical applications. They also have a scavenge/purge port to be used with vacuum in clean room applications and air supply to keep particulate away from jaws. 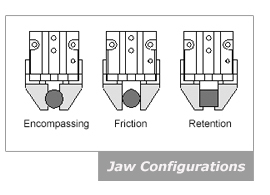 How to Choose a Jaw Configuration? The jaws are custom tooling designed to securely hold the object at task. They will make contact with the object and much thought needs to go into the correct jaw design because it will have a major factor in the force requirement of the gripper. Friction gripping jaws rely completely on the force of the gripper to hold the object, they are the easiest to fabricate and may require more force to hold the object. This is especially true for objects that do not have flat surfaces. Parts can be dislodged by forces applied from any direction. Retention or encompassing gripping jaws will hold the object and cradle it in the jaws. It is the preferred method since it adds stability to holding the object and requires less force to hold the object, to drop the object you must overcome the force to open the jaws. Keep in mind that the travel stroke of the gripper may have to be increased to encompass the object. If the jaw encompasses the object 1/16" on both sides, then the stroke length requirement will need to be increased by 1/8".